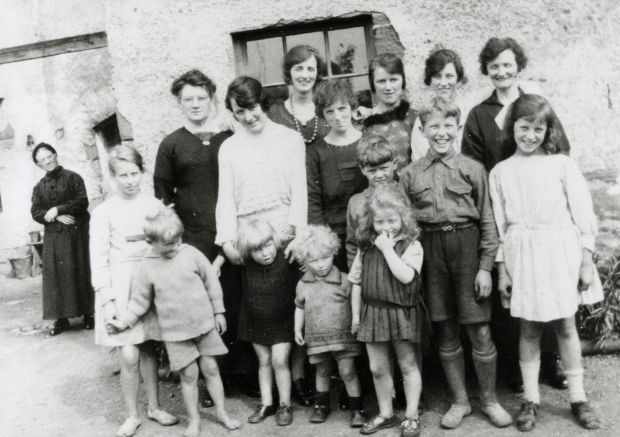 "The photograph was probably taken during the summer of 1924 at the rear of the Urquhart's house in Bank St, Cromarty. The corner of the archway through to Bank St can be seen above Rhoda. The Ferguson family were neighbours of the Urquhart family. Ladies (except Granny Ferguson) have their subsequent married name in brackets. My grandfather is Gilbert Magnus Urquhart (married to Edith Catherine Alcock) who I presume is Magnus Urquhart in the photo. My mother was Gillian Frances Urquhart, deceased 1997. There is alot of the Urquharts. It's a good photo, I am one off the Urquharts. I teach third grade at Napavine Elementary School and have compiled a casual history of the community for use with my third graders. James Urquhart is mentioned in some of the clippings I have read. I am interested in stories of the Urquhart family at Napavine and any other early families of this community. Thanks.